Ever one to put the rest of us to shame, Stephen Zimmer has another release forthcoming. This one is very different from his other work, and I don’t know about you, but I’m STOKED to get my hands on a copy of this! Seventh Star Press is proud to unveil the cover art by Matthew Perry for Hellscapes, Volume 1, the first of a brand new horror collection from author Stephen Zimmer. 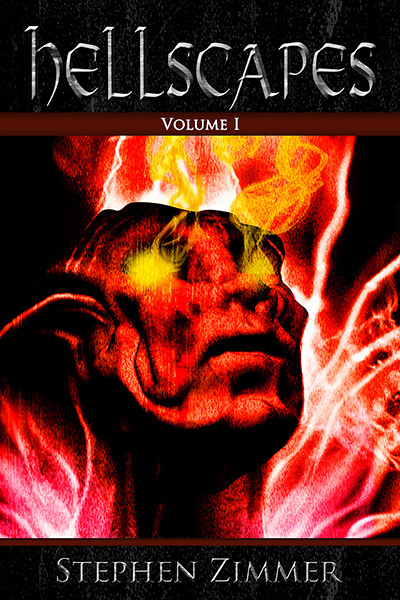 The novella-sized release features five stand-alone short stories that have a connection in that all of the tales are set in different aspects of Hell. Readers can look forward to some recurring characters as the collection unfolds, as well as a wide variety of environments and styles of stories. The eBook will be available on Friday, September 6, and print availability will arrive in the following week. In “The Smallest Fish”, the story is told of a ruthless business mogul who finds himself in an abandoned, ruined version of the city he knew well … in life. This city won’t be remaining vacant for long. Seventh Star Press is a publisher of speculative fiction based in Lexington, Kentucky. Full press release can be found here!